This adaptable shrub shrub from Western Australia grows in a variety of soils. Will grow in wet and dry soils, full sun or partial shade and is frost tolerant. 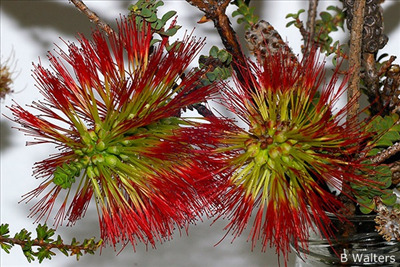 Flowers open up lime green with red tips and change to bright red as they are probably pollinated. Good low windbreak or screen. Propagation Information: Grown by cuttings or from seed.